Over the years, when we would have the missionaries over for dinner, they would always ask before they left if there was anything they could do for us, and we always answered no. Sometimes I would laugh a little and say that I needed lots of things, but none of them were things that they could help with. We would send them on their way. I think I felt that if we asked them for anything we would be taking them away from their work, so if there was any other way to solve a need we shouldn’t call on them. Then we had to move, and one of our chief volunteers, with a truck and trailer, was our former bishop and current mission leader. He called up the missionaries, and the elders pitched into the needed labors several times, and with willing smiles. That was wonderful, and so much help — and moving was one of the classic types of service that young elders did. That made me pause. Such service was part of their work, not taking them away from their work. It was okay to ask. One of the things we asked the listing agent to add to our rental agreement was that we had permission to put in a small garden. She assured us that this was no problem at all — where did we plan to put it? I didn’t know yet, exactly, because I hadn’t had a chance to look with that in mind. It’s a small lot, and I was envisioning someplace in the back; but when we had a chance to look, there was a natural spot along the street side. The property slopes slightly from front to back, and from the house to the side street. If you go out the back door you step onto a platform, and then you have to go left, down three steps, or right and down four, to the cement walkway that runs along the back and continues to the side gate and out to the sidewalk. I measured the width of one lawnmower pass along the side of the house, and that left a seven-by-seven-foot square section, which served as an automatic raised bed. It even had a small line of cinder blocks on the far side, away from the back walkway. Perfect, but it was overgrown. Neither one of us was capable of digging it up. But we had always grown something, even if it had come down to only tomatoes and zucchini. The previous year, for the first time, we hadn’t even had that. Because I was in an accident and my husband wrenched his knee within the same week, we didn’t even grow tomatoes in 2012. A generous friend found all her various tomato plants booming at the same time and shared her surplus, which kept us out of misery, but we had none of our own. As far as I’m concerned, one of the reasons to have summer at all is to be able to have real tomatoes. Here was a place with sunshine and easy reach, but we needed some help. We asked the missionaries if they could come dig up the garden space for us. I promised that if they were still in our ward when the vegetables were ready, I would feed them from it, and if not I would feed whoever was. They came and worked hard. I planted gallon pots of tomatoes that did splendidly, likewise starts for snow peas. 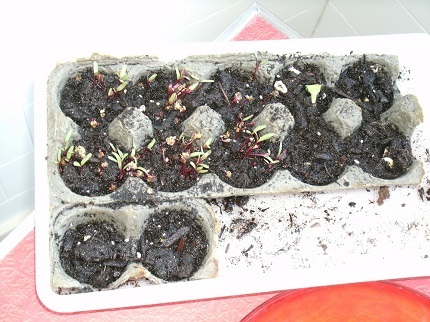 I started beets inside, which didn’t grow after they went into the ground. Chard did okay. I thought of beans late, and, assured by a friend that there was time for them, I planted seeds that shot up fast and then stalled into nothing. I was so happy to see these little purple and green bits coming up last year. Unfortunately, they didn't make it later out in the cold cruel ground, in proximity to the potatoes. My first try at growing beets failed. I had put potatoes into the section in the far corner. My mistake. They apparently crowded out everything underground, usurping nourishment. I did get potatoes, harvesting some of them when they were quite small so that our garden-digging elder from an Idaho farm could get a dinner before his transfer, with those potatoes, snow peas, and cherry tomatoes to demonstrate our appreciation and thanks — and to show that their efforts had not been wasted. So I vowed, of course, that next year (which is this year) I would know how to do this better. This year new elders kindly came to dig it up again and spade the earth to make it ready, and I began again. Later they came back for a second round and dug up a section on the other side of the back walkway. We were ready to go. I missed my chance for the source of the same perfect tomatoes, so we bought different varieties somewhere else. I had had my taste buds set all winter for those “chocolate cherry” tomatoes, and didn’t find them. We bought five different kinds with different maturation schedules, so they would bear fruit in sequence. I put the really tall tomato cages, as it turns out, around the plants that didn’t grow tall at all. 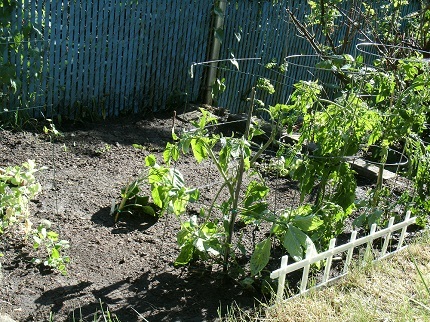 Here is my brand new garden space last year, with the tomatoes and sugar peas planted. Both of those did well. The golden cherry tomato plant has been prolific, but the longest branch shot out below the first rung on its wire cage and goes out on the ground where it could rot, so I have to check on it daily. I bought a different variety of sugar peas, and it was a disappointment. We only got about half the total of last year, so I’ve found and planted some seeds of the type I bought last year in hopes that they’ll grow another crop before it gets cold. I bought starts and seeds for three different kinds of beans, and I’ve decided that pole beans are easier to grow and pick than bush beans. The winner for next year is “Kentucky Blue Pole,” which is a cross between “blue lake” and “Kentucky wonder” types — they definitely win the taste and ease tests. Oh, they’re good. I wanted to grow winter squash, not just zucchini. My favorite type wasn’t in the local stores last fall, so I went looking online and found that “red kuri” is a Japanese heirloom squash, and I ordered seeds. They’ve developed more slowly than the instructions said, but I’m hoping they set fruit. I have more seeds for next year, and I’ve found other types I want to try. Notice that I’m making plans for next year. I learned more things this year — not all my problems were solved by last year’s first try. I moved the potatoes over to the other section, so I will get beets — but this year the potatoes didn’t come up at all. The squash will go over there again, where there’s plenty of room. Now I just hope for enough bees. Beans are wonderful, but you have to make sure they have enough support height, and I know which type of sugar peas will thrive. I think I lost most of my golden beets, but I have a few, so we can see how they compare. I need to plant more chard. I tried leaf lettuce for the first time, buying a group of assorted starts at the farmer’s market, and I might skip that next time. One type I didn’t like, one I loved but I haven’t been able to identify what it is (it has triangular leaves, thick like butter lettuce and sweet), and the others were just okay. I need to plant more green beans in staggered start dates, and I’m going to plant spinach even though my husband gets his chard and he considers it to be “instead of” spinach. And there will always be tomatoes. If I can’t have tomatoes, you can forget about the whole thing. 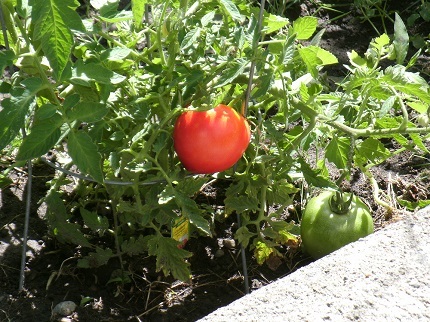 Here is our first full-size tomato this year. Many more are coming. I’m so grateful for the service of those with strong backs and a willingness to attack my plot of dirt, twice this year. Otherwise, I wouldn’t be able to have fresh food on my table from my own ground. Nothing else tastes as good. I fed this year’s elders on Sunday with green beans and cherry tomatoes, and since these two really like to dig into dirt, they’re coming back to help again with something else. That’s one of the blessings of this life, that you can try new things, you can test out your ideas, and you can try again as you learn from imperfect experiences. It’s all right to make mistakes, and to not be an expert. You can find those who enjoy sharing the process with you, and pass along the gifts that come. There are so many kinds of gifts. Life is good.